19 HP increase, 7 extra foot pounds of torque increase. It was our continuing effort to give you a performance exhaust choice that led to the development of the GXP-RCD kit. 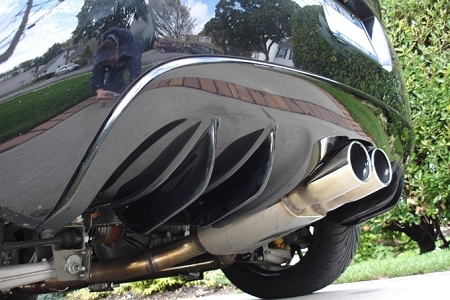 We designed and manufactured this dual in, dual out true X design 11” muffler just for this application. The regular 14” muffler we had just wouldn’t fit, the space constraints that are inherent in the GXP for rear center duals offered another interesting benefit. The sound is very unique, this kits sound falls right in between our Mach and our Street Race. The GXP-RCD kit package totally transforms your GXP in both looks and sound. • This is a rear center dual configuration. 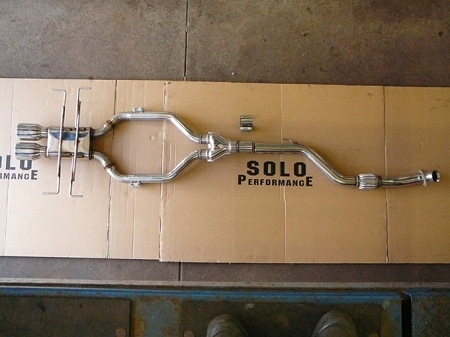 • Solo’s mid-range sounding exhaust kit for the turbo GXP. • Classed as moderate sounding high performance. • The best transition stamped stainless steel Y pipe is used to take the system from a single 3” to a dual 2 ½”. 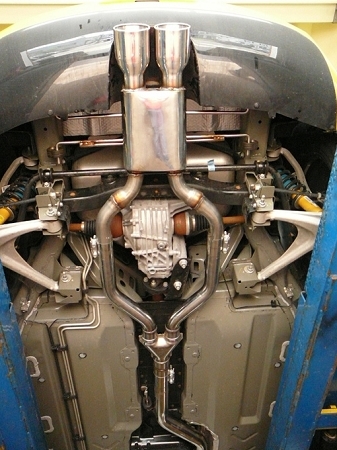 • The dual 2 ½ pipes used here are more flow that the single 3”. • We decided to go with the more difficult design of a dual in dual out muffler. • This muffler is a heavily packed with ceramic fiber and stainless steel wool, and a true X design muffler. Made from stainless steel. We made and toned this muffler specifically for the 2.0 Turbo, Ecotek engine. 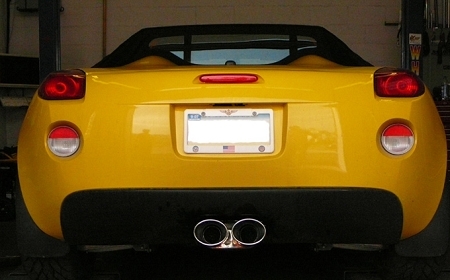 • The tailpipes flow into a beautifully crafted dual oval stainless steel exhaust tips manufactured by Solo Performance. • Professionally painted to match your car. TO ORDER: PLEASE CALL THE ABOVE NOTED NUMBER. 855 points will be rewarded to you when you buy this item.